After the financial budget presentation on Mar 16th, for the year starting April 1st, Finance Minister Mr. Pranab Mukherjee told the Parliament that GAAR was aimed at tax evaders, but did not specify how it would be used in relation to participatory notes (P-Notes). GAAR (General Anti-Avoidance Rule) as the name suggests is used to counter the aggressive tax avoidance schemes. It empowers officials to deny the tax benefits on transactions or arrangements which do not have any commercial substance or consideration other than achieving tax benefit. It contains a provision allowing the government to retroactively tax overseas deals involving local assets or stocks. It could also be used by the government to target participatory notes (P-Notes). Tax Avoidance can be termed as an attempt to reduce tax liability through legal means, i.e. to regulate your affairs in such a way that you pay the minimum tax imposed by the Act as opposed to the maximum. What would happen to the Mauritius route? .. GAAR could give powers to the tax department to deny double taxation treaty benefits to foreign funds based out of tax-havens like Mauritius. India has a Double Taxation Avoidance Agreement (DTAA) with Mauritius. Article 7 of DTAA addresses the taxability of the business profits, it stipulates that the profits of an enterprise of a contracting state (Mauritius) are to be only taxed in that state, unless the enterprise carries on business in the other contracting state (India) through a permanent establishment (defined as a fixed place of business in Article 5 of DTAA). Overseas portfolio investors, routing their investments via countries like Mauritius, currently do not pay any tax on short-term capital gains. Now, why are the participatory notes targeted? .. Participatory Notes or P-Notes are used by investors or hedge funds that are not registered with SEBI; for making investments in the Indian Stock Market. Participatory notes are instruments that derive their value from an underlying financial instrument such as an equity share and, hence, the word, ‘derivative instruments’. SEBI permitted FIIs to register and participate in the Indian stock market in 1992. 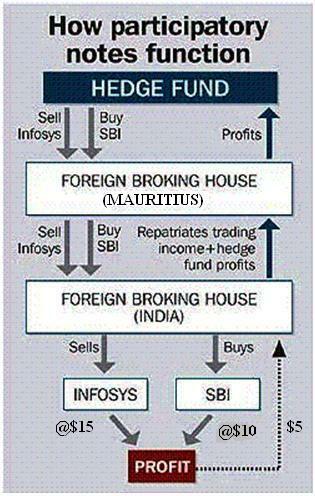 Indian based brokerages buy Indian-based securities and then issue PNs to foreign investors. Any dividends or capital gains collected from the underlying securities go back to the investors. The advantages that P-Notes render to the FIIs are Anonymity, Ease of Trading, Tax Saving and Money laundering. There are concerns raised by the US industry to take up the retrospective tax issues with the Indian Finance Minister. The bodies constituting the US industry have representations from various sectors including the financial service and IT sector – these bodies include Financial Executives International, Financial Services Forum, Information Technology Industry Council, Investment Company Institute, Managed Funds Association, National Foreign Trade Council, Securities Industry and Financial Markets Association, Software Finance & Tax Executives Council, TechAmerica, US Chamber of Commerce, United States Council for International Business, and the US-India Business Council. These bodies have urged the US Treasury Secretary, Mr. Timothy F. Geithner to seek clarity on this tax proposal, as they foresee a significant negative impact on their member companies, customers and shareholders. And the implementation of these provisions will have immediate and severe consequences for companies, affecting the willingness of companies to commence or continue their operations in India. 1) Impermissible Arrangement : Most of the FIIs follow the post office box arrangement (trader is based in USA and the trading is being done on the Indian Stock Exchange based from New York and they show it on paper that it is out of one of the countries where they don’t have to pay tax then clearly that is an impressible arrangement, if they have only a post office box address), which is not permissible. 2) GAAR is not retrospective : This is applicable only for income with effect from April 1, 2012.